Few Japanese music artists, or even popular songs, gain significant international attention. The language barriers, both in the lyrics and those endemically ingrained within the structure of the music industry itself, ensure a near impenetrable barrier for musicians to breakout to the wider world. A number have tried but with limited success. Even Seiko Matsuda, the eternal idol of Japanese pop, creator of nearly fifty studio albums and over eighty singles, has only scratched the surface of the US market despite a valiant campaign in the English language. Today, most people outside Japan think of the shamisen and elegant geisha staring dreamily into the distance when they imagine Japanese music. And even then it is probably confused with traditional styles from China. But one song did crack the Great Wall of Japanese Music. Known in Japan as Ue O Muite Arukou, it became the only Japanese language song to top the US Hot 100, over fifty years ago. The song is about the desperation of lost love but is an abstract concept referring to a lost, but dearly cherished belief, as much as the loss of a lover. In fact, it was written in the student frustration of the US military presence in Japan and the perceived loss of national identity. The title translates as "While I walk around I look up" the implication being so that the narrators tears cannot fall to the ground. And then some genius changed its name to "Sukiyaki" in English; as the phrase goes, that's the same as re-titling Imagine as Cup Noodle. It's a beautiful song with absolutely nothing to do with the English lyric versions to come. Those were simply made up. 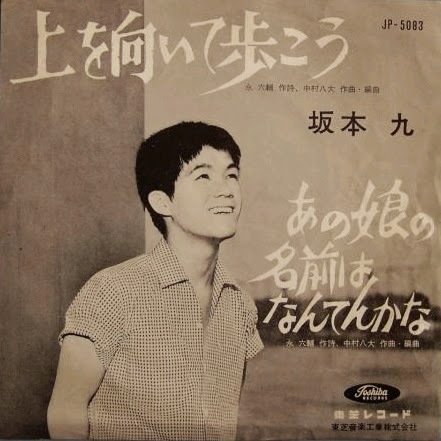 Although he neither wrote the music nor the lyrics, the song was made famous by the inspiring interpretation of Sakamoto Kyu in the early 1960's. Still a teenager when he laid down the recording, the success led to over thirteen million copies being sold worldwide and chart appearances across Europe as well as that #1 spot in America. And then at 6:12pm on 12 August 1985 Sakamoto boarded JAL Flight 123 from Tokyo to Osaka along with 523 other passengers and crew. In-flight failure of the rear pressure bulkhead took the aircraft from the skies along with the lives of all but four of those onboard in the worst single-plane accident in aviation history. And Kyu Sakamoto was gone. You have to wonder though, maybe now he's finally walking around looking down instead of up, smiling that so many people still sing his music and some maybe even sharing his thoughts.